Chicago is cutting funds for counseling to the people who need it most, and then sending in more police officers. 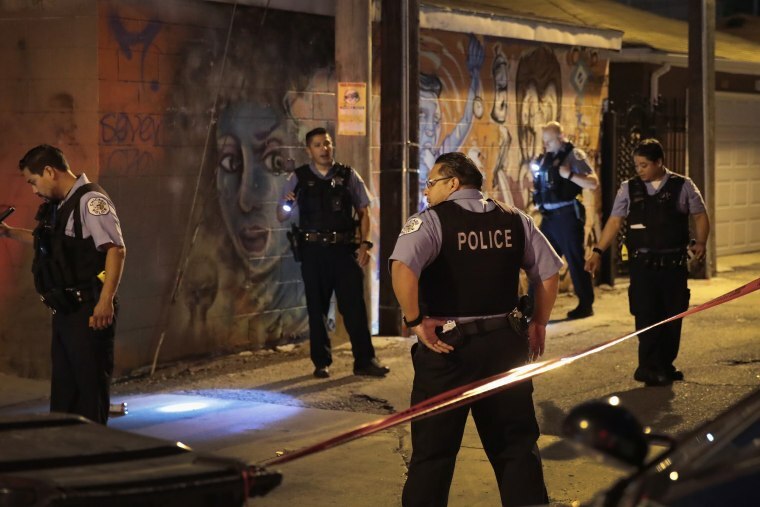 Violence in Chicago is a symptom of two things: The systemic neglect of communities of color; and a lack of economic, educational and health — physical and mental — resources. Generations of racist policies have abandoned entire pockets of the city to a level of trauma more often seen in warzones around the world, creating cycles of poverty, violence and trauma. And what’s completely missing from the national dialogue about gun violence in the city is an honest assessment of the mental health needs of communities who have directly faced violence and trauma. That’s not the conversation that politicians (most of whom have no real interest in providing solutions to gun violence or inadequate mental health care) seek to have after any headline-grabbing mass shooting. But we need a national conversation about the lasting effects of gun violence on survivors, as well as those left behind to pick up the pieces after a loved one dies. I'm not a disinterested observer. The first time I heard someone get shot, I was 8 years old. Three months later, news outlets were at my school following the brutal murder of my teacher. I lost my first friend to gun violence when I was 15 years old; two years later another friend was shot and killed on his front porch. At 18, two young girls I’d known since their birth were killed within a week of each other. My cousin was killed when I was 19. I’m now 30 years old and have lost 29 loved ones to gun violence in the Chicagoland area. Grief counseling was never offered to me or any of my friends; we weren't given any way to learn coping skills to handle the trauma we experienced. Our mental health is not — and has never been — a concern of our elected officials. According to the National Center for Post-Traumatic Stress Disorder, though, PTSD in children and teens can include post-traumatic play or reenactment through play, drawings or in how they talk. For example, a child who witnesses or experiences a shooting may play more shooting games. Teens with PTSD are more likely to engage in reenactment (which involves a change in behavior, such as carrying a weapon) and are more likely than children or adults to exhibit impulsive and aggressive behaviors. In other words, they are more at risk of perpetuating the cycle of trauma and violence. But the impact of trauma doesn’t end there. The CDC found that more adverse childhood experiences (ACEs) also means a higher the risk to physical health, including asthma, diabetes and heart disease, as well as decreased economic and educational opportunities. Yet, despite all the attention on gun violence in Chicago — after two straight years of more than 600 gun-related homicides — the city and the state of Illinois cut mental health services and continue to avoid adequately funding Chicago’s Office of Violence Prevention. The two-year budget standoff in Illinois resulted in the loss of access to care for 80,000 people. A study by the Community Behavioral Healthcare Association of Illinois found that approximately two-thirds of the nonprofit mental health and substance abuse agencies in Illinois were forced to reduce or eliminate programs and services. Already over the past decade, the financial and personnel resources in the city for crisis intervention have all but dried up. The city has closed half of its mental health centers, and confusion about whether facilities like the Community Counseling Centers of Chicago will remain open has made access to care even more challenging. In a state where school funding is driven by property values and taxes, there’s also significant difference in availability of student support services. For its more than 392,000 students, Chicago Public Schools had 323 social workers (who often had to move between schools) during the 2015-2016 school year. Meanwhile, suburban school districts have teams of social workers and counselors in their schools. Some, such as Indian Prairie School District 204 in Naperville and Aurora, have a social worker and multiple counselors for each grade level in their high schools. Although our city is in the midst of what could be considered a mental and public health crisis, public leaders continue to ignore the realities at hand and are trying to police their way out of our gun violence problem that is part of a cycle of poverty and trauma that law enforcement cannot solve. The city budget set aside $2.4 billion for police, but only $11 million for mental health services and violence prevention programs combined. The reality is we will only begin to stem the tide of violence in our city when we confront the root causes of gun violence in Chicago, rather than the individuals who committed any individual act. Camiella Williams is an organizer with LIVE FREE Chicago and a trustee at a local community college.